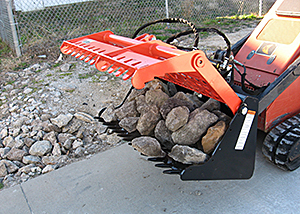 Rocks are no problem…the 42-inch Sweep Action Rock Grapple with it’s 39-inch wide upper grapple sweeps rocks into the tine bucket and retains them there. The bucket features tines of solid 1” material spaced on 3” centers to retain rocks while allowing the dirt to be sifted out. Single sweep action grapple pulls rocks & debris into the bucket. Optional bolt-in bottom of 10-gauge steel, item #812265 is available (standard side plates shown installed). 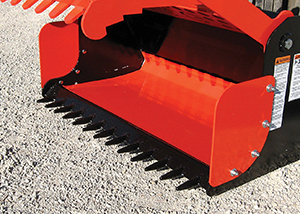 Universal mini skid steer mount – fits Toro-Dingo, Boxer, Ditch Witch, Ramrod, Vermeer and others. Hoses and flat-face couplers are standard equipment. Bolt-on side plates are standard to help retain smaller rocks if needed. Optional bolt-in solid bottom available to retain smaller materials.